Additional Cooking Equipment: Baking sheet or roasting pan. For the most appealing result, select root veggies of contrasting colors. 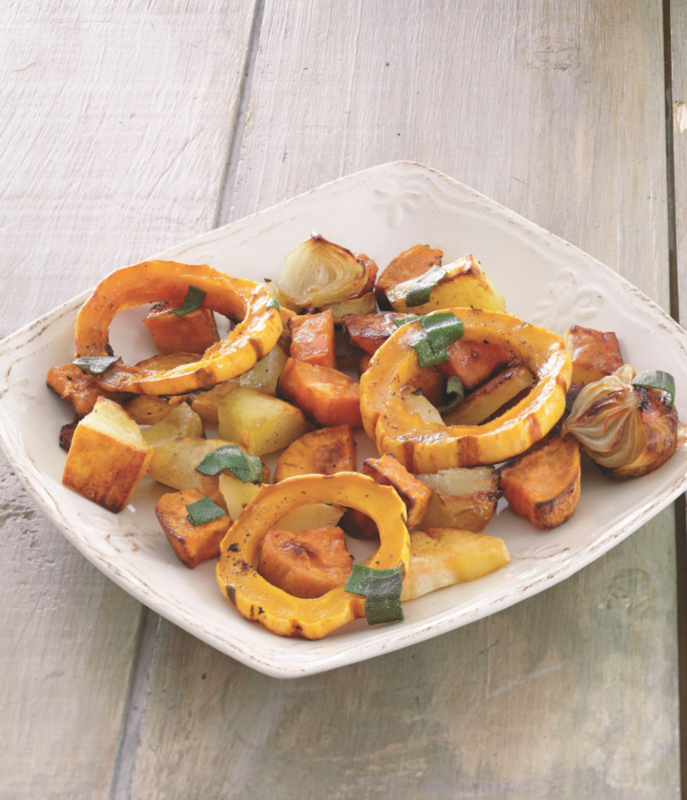 You can leave the peels on all the veggies—even the acorn squash. Just scrub them well, and make sure you cut the squash into semicircles for easy prep and beauty on the plate. (Adult & Child) Adult slices the vegetables. Child can then cut into bite-size and attractive-looking pieces. (Adult & Child) Place the vegetables in a large bowl, add olive oil, and season to taste with salt and pepper. Toss. (Adult) Oil the baking sheet with some olive oil. Spread the vegetables on baking sheet. Bake in the preheated oven for 30 minutes, or until vegetables are caramelized (browned or roasted to sweetness). (Adult) Meanwhile, melt the butter in a small skillet over medium heat. (Child) Tear up sage leaves and add to the skillet. (Adult) Cook until the butter browns but does not burn. Remove from heat; add the vinegar and season with salt to taste. (Adult) Serve by placing each portion of veggies on its own plate. Drizzle just enough of the sherry-sage butter over the veggies to add taste—don’t drench.